Home Insights Direct-to-Consumer Genetic Testing: Will It Go Away? DTCs tests usually involve collecting a DNA sample at home, often by swabbing the inside of the cheek, and mailing the sample back to the laboratory. Consumers are notified of their results by mail or over the telephone, or the results are posted online. In some cases, a genetic counselor or a healthcare provider is available to explain the results and answer questions. The price for this type of at-home genetic testing ranges from several hundred dollars to more than a thousand dollars. These companies offered consumers everything from identification of genetic predispositions to specific diseases to athletic capabilities assessments. Whole-genome testing, offered directly to the public, is the latest development in personalized medicine. Companies typically offer to test for genetic traits that predict the risk of disease or estimate the effectiveness of drug therapies. In a typical test, up to a million single nucleotide polymorphisms (SNPs) may be analyzed. A customized report is generated, describing the SNPs and one’s individual risk factors, usually based on population-level studies of what these SNPs mean. But given the complexities that have merged in characterizing the human genome, and the storm of questions about the practice of providing consumers with DNA sequence information without the guidance of professional interpretation, companies have stopped offering the tests or nimbly turned to analytic services that go way beyond sequencing. Unlike genetic testing for mutations in known hereditary cancer susceptibility genes such as BRCA1/2, these genomic profiles examine DNA variants, which typically have a minimal risk impact, account for only a fraction of the heritable component of cancer, and do not consider family history or other known risk factors. Thus, the clinical validity and utility of personal genome scans for disease risk prediction remain for the most part unestablished, although some argue lack of evidence of harm and that there is the possibility of a positive impact on health behaviors or increased genetic awareness. 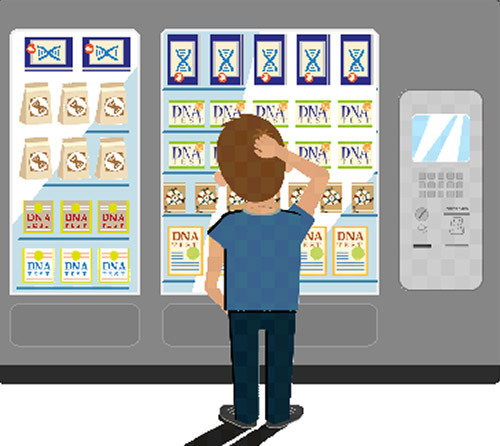 The FDA has to some extent clarified how it intends to regulate what some had referred to as the “wild west” of DTC genetic testing. In 2010, the agency the agency published letters it had sent to five genomics companies, 23andMe, Navigenics, deCODE, KNOME, and IIumina, informing the companies that they were violating medical device regulations by manufacturing and selling their testing products without appropriate review and approval. In November 2013, the FDA changed the landscape for DTC testing, sending a warning letter to 23andMe, a provider of a so-called “spit kit,” the company’s saliva collection kit, and personal genome service. The letter enjoined the company from selling the kit, which the company said provides information on everything from the risk of breast cancer to a person’s ancestry. The agency told the company it was marketing the kit without clearance or approval in violation of the Federal Food, Drug and Cosmetic Act. Regulators questioned both the reliability of the tests and the appropriateness of directly providing the consumer with potentially actionable medical information. The company had maintained that its DNA tests provided general information rather than a medical service. In 2012, however, the company reversed that stance, submitting paperwork for FDA clearance on its genetic tests. Fifteen months after its 2013 warning letter, the FDA granted marketing approval of a specific 23andMe home-use test that detects a variant in a single gene, the BLM gene for Bloom Syndrome. The rare disorder occurs more commonly in people of Central and Eastern European, or Ashkenazi, Jewish background. One in 107 people of Ashkenazi Jewish descent are carriers for this disorder, which is characterized by short stature, sun-sensitive skin changes, and an increased risk of cancer. If both parents carry the autosomal recessive gene, there’s a 25% chance of their offspring having a cancer-predisposing disease. 23andMe obtained the clearance through the agency’s de novo regulatory pathway, reserved for low- to moderate-risk devices with no market precedent. The FDA has also classified autosomal recessive carrier screening tests as Class II, allowing the products to forgo premarket review and clearing the way for similar devices to enter the market, the agency said in a statement. Thus, if FDA chooses to classify a specific lower-risk genetic test as Class I or Class II, full premarket approval would not be required for that test. Opinion remains divided as to whether the agency’s ruling against 23andMe could further discourage companies from entering the already struggling direct-to-consumer genomics market. In December 2013, 23andMe announced that it would comply with the FDA’s directive to discontinue consumer access to its health-related genetic tests during the ongoing regulatory review process. The company has continued to provide consumers with both ancestry-related information and raw genetic data and to allow customers who bought kits before the warning letter was set to see their existing test results. Now, new startups like Color Genomics that are focused on DTC tests offer spit kits only through physician’s offices. Color Genomics offers a $249, 19-gene analysis, including BRCA1 and BRCA2, related to breast and ovarian cancer, making it potentially accessible to most women. Following analysis at Color’s CLIA-certified labs, results are returned to testers, who will be able to get in touch with board-certified genetic counselors at Color about the next steps based on results and a screening prevention plan. The company’s website clearly encourages every woman to get tested. “Every woman should have the choice and opportunity to get tested for her genetic risk of breast and ovarian cancer in an affordable, accessible, high-quality way, and that knowledge of a woman’s genetic risk empowers her to work with her physician to develop a personalized plan based on that information” the site says. The NIH says because harmful BRCA1 and BRCA2 gene mutations are relatively rare in the general population, most experts agree that mutation testing of individuals who do not have cancer should be performed only when the person’s individual or family history suggests the possible presence of a harmful mutation in BRCA1 or BRCA2. Having seen the writing on the wall, some companies that offered direct-to-consumer genome analyses have either gotten out of the business or changed their game plans. Knome now calls itself “The Human Genome Interpretation Company,” with a disclaimer on its website stating that it does not offer personal genomic analysis. In a 2012 article in Nature, Jonas Lee, Knome’s Chief Marketing Officer said “We stopped working with the ‘wealthy healthy’ in 2010. The model changed as sequencing changed.” The new emphasis, he says, is now on using Knome’s technology and technical expertise for genome interpretation. Rather than operate in an environment of uncertainty, companies have formed strategic alliances to further their interpretation enterprises. Genalice and Knome jointly announced on January 15, 2015 a strategic partnership to offer their products together as a turn-key solution for those using next-generation sequencing (NGS) data to interpret patients’ genomes. Genalice Map will use its preprocessing solution for aligning and calling NGS data and seamlessly connects to Knome’s informatics and genomics interpretation system, the knoSYS® platform. Knome says its knoSYS platform provides an “end-to-end” solution for the operational needs of clinical labs that are developing tests based on NGS. Users can process raw data through all the remaining steps of analysis: sequence alignment, variant calling, quality control, annotation, filtering, and reporting. Several new companies focused on post-sequencing analysis have emerged. Companies like Personalis says its goal is to enable accurate clinical grade insights into genomic data, not only sequencing DNA samples but also in alignment and variant calling, and variant analysis to find those that may cause disease. In January 2015, Personalis announced it had raised $33 million in a Series C financing round, bringing the total amount of venture capital raised as of that date to $75 million. Personalis says it will use the funds to scale up its operations, having launched cancer genome analysis services (the ACE Exome for Cancer and the ACE Extended Cancer Panel) and updated its existing ACE Clinical Exome test for inherited diseases in Fall of 2014. This article was originally published in the September 2015 issue of Clinical OMICs. For more content like this and details on how to get a free subscription to this digital publication, go to www.clinicalomics.com. What Will Succeed Lipitor as the Next Blockbuster Cholesterol-Lowering Drug?